Living in a treehouse is indisputably incredible. Sure, you might be roughing it a little bit, considering there's a climb and the trees are flammable (thus limiting your cooking capabilities). But the views and the experience are unmatched. 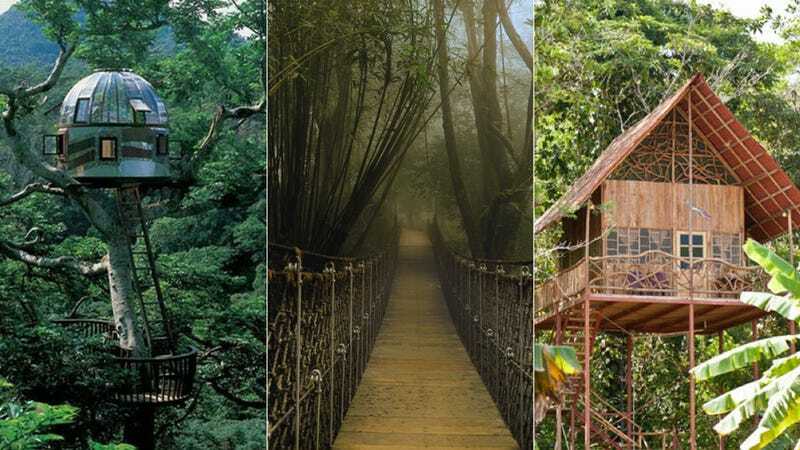 From the antique to the futuristic, here are some of the most beautiful tree-borne homes we've ever seen. If these images fill you with wanderlust, take note: some of these houses are also hotels. This giant hillybilly hut is located in Crossville, Tennessee. The structure itself is 97-feet tall and it's supported by an 80-foot tall live oak. Hovering 21 feet above the ground, Peter Lewis's Bridgton, Maine treehouse boasts a drawbridge and several spiral staircases. GreenLine architects' whimsical Crystal River tree dwelling looks like something straight out of Alice and Wonderland. Traveling to the southwest coast of India? Make plans to visit the Vythiri Resort, where you can stay in a treehouse like this one. The Beach Rock Treehouse in Okinawa, Japan was built to look like it belonged in outer space. Are we even sure that's actually Japan and not Endor? La Cabane Perchee is a French company that will build you your own treehouse, like this bamboo home the designers built for an architect client. Or this one, which La Cabane Perchee designed for a resort in Lorraine, France. For $40/night, you can stay in this treehouse in the Natural Park of Sierra de Huétor in Andalucía, Spain. This sanctuary tree shack is perched above a private rainforest near a hot spring in North central Costa Rica. It's also available on Airbnb. Commanding views of Falmouth Bay, the bird-like Tree Sparrow House is waiting for you in Cornwall, England. This diminutive treehouse in Ariena di Castro, Italy, looks utterly idyllic. Here's a hut that was built around a Redwood tree in the Santa Cruz Mountains. Shitake is nestled into the woods of Oregon's secluded Cave. It's like a mini Japanese tea house in the trees.